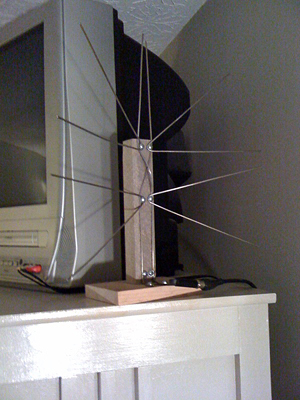 I finally got around to testing out a do-it-yourself antenna made with scrap materials I had around the house. If you haven’t heard of this, do a google search for homemade antenna and you’ll find all the info you need to build your own. Basically, the point to this is that you can make a better antenna with scrap wood and coat hangers, than the powered ones you can buy at an electronics store (which sell for $30 and up, typically). The only part you have to buy, assuming you don’t already have one from something else, is a 300 > 75 ohm transformer (avialable at Radio Shack and probably any other electronics store for about $5). So, since I happened to have a transformer already, scrap wood and extra coat hangers, I set about to build the version you see to the left. This followed the online plans pretty strictly, just with one less set of ‘whiskers’, if you will. Since it was a test, I didn’t worry too much about the finish, I just wanted to see if it would work. And I’m happy to tell you, that it works perfectly. It is a bit directional in the way it works, so I had to turn it to the angle you see in the photo to pick up all the channels, but that’s the important point here… I now pick up all the channels, whereas with the powered rabbit ears I used to have, I regularly couldn’t get a couple of the major local channels, had spotty reception on several others, and couldn’t get a couple altogether. Now they all come in with a strong signal. Not bad for about 20 minutes of my time, eh? So, after I built this, I got to wondering what other shapes you could get away with, as it seems the major component you need is just more metal than your average rabbit ears. 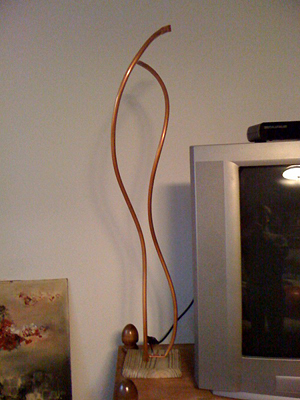 I happened to also have a sizable coil of copper tubing from a dishwasher install years ago, so I decided to see if a sculptural shape would work as well. And, guess what… again, it works better than the powered antenna that used to be attached to this TV. This one is in the basement, so there is one local channel that it doesn’t pick up, but all the others are clear as a bell and consistent. This is about %100 better than the purchased, powered antenna that was previously on this TV. I think the limiter on this version is the height. I’m pretty sure if I soldered some thin rods onto these larger tubes, so that the overall height was increased by nearly twice, I’d be able to pick up that last, local station. All this got me to thinking about the copper work my sister-in-law does. She makes all these really awesome indoor and garden sculptures out of copper, that incorporate leaf and flower shapes. These would probably be perfect for an antenna. 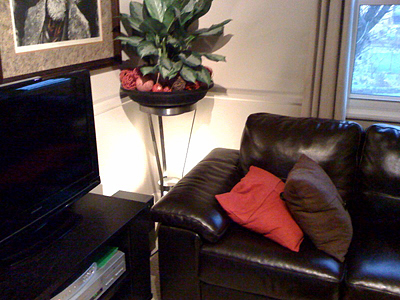 You’ll notice that the plant stand appears metallic… Yep, that’s right, it’s made out of steel so just happens to be a big piece of metal sitting right near the TV. So, I made a little copper clip that could fit around one of the feet at the bottom. There’s also another piece behind the couch that consists of 4 copper rods on an 18″ long base, since you need to connect the transformer to two sources. And, yep, you guessed it, it works %100 better than the powered antenna that used to sit behind the TV. This one now picks up all local stations just like the first one in our bedroom. So, there you have it. 3 new antenna, $10, a couple hours total of my time. I’ll go back and make the ones prettier in our bedroom and basement, but I’m pretty happy with my solution in the living room. I need to tweak the shapes of the part behind the couch since the over-the-air signals are directional. But, all-in-all, a huge success and proof to everybody who’s not interested in paying for cable that you can get all the local channels if you want, for much cheaper than the cost of an antenna at any store. Plus, if you’re creative you could make it into something that nobody would ever guess is a TV antenna. Questions about how to build these? Ask away! It couldn’t be simpler. I don’t know why, but this is the only thing that came to mind when I read this week’s Illustration Friday theme. 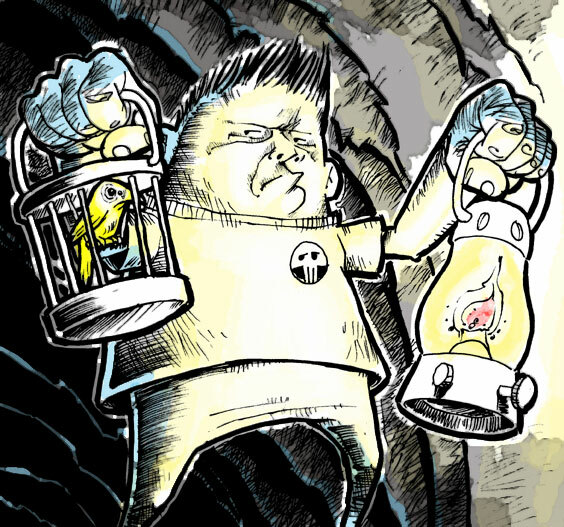 And, since it is Sparky, it just seemed natural that he’d be carrying a canary in case of gas. Why is he concerned?… who knows… maybe he had gas station burritos for lunch. I experimented a little with using a wet media type brush to simulate layers of wash (somewhat like dye). Also experimented with a very limited palette to minimize complexity, since the line work is so strong. Overall, I’m pretty happy with the end result. So, a buddy of mine and I had a conversation about how funny it would be in a cartoon (animation, specifically) if, over time, they continually simplified the style, to see if anybody would notice. Of course, I thought it would also be funny if you did the same thing in a 3-panel comic, where the first panel is detailed, the second less-so and the third would be stick figures. Anyway, comedy is all in your point-0f-view, right? All stupidity aside, I actually am pretty happy with the first and third panel. I adjusted my detail pattern a bit in the first and like the end- result. And the third… well, c’mon, it’s just fun to draw like a 4 year old. Plus I actually think I did a pretty good job of simplifying Sparky down to his essence. I should consider doing some things in that style to see where it goes. Check out Illustration Friday for all the other submissions. You are currently browsing the Timjohnillustration's Blog blog archives for March, 2010.